The Hawaiian Islands are part of a long archipelago in the Pacific Ocean. There are eight major islands, but most travelers visit Oahu (the main island), Maui, Kauai or the Big Island of Hawaii. Oahu, with its bustling Waikiki scene, is the most common senior trip destination, but all the islands have their individual merits. As mentioned, most senior class trips to Hawaii are based out of Waikiki, a section of Honolulu along the coast just west of the iconic Diamond Head crater. The beach is a long strip of sand that is packed with sunbathers and smells faintly of coconut oil. The water is warm, and the rolling waves are usually perfect for learning to surf. There are innumerable fashionable shops lining Kalakaua Blvd, and there is also an abundance of nightlife for all ages. 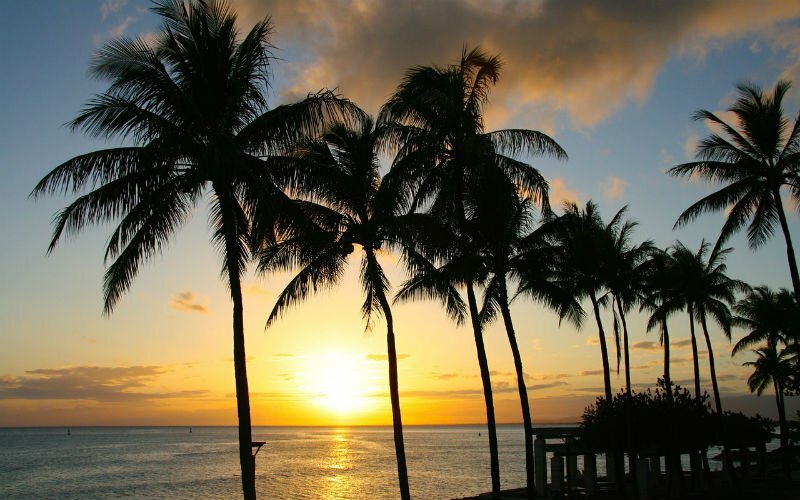 Outside of Waikiki, there is the Arizona Memorial in Pearl Harbor, Hanauma Bay (a snorkeler's heaven), Diamond Head, the Polynesian Cultural Center, surfing's infamous North Shore, assorted authentic luaus, as well as many different hikes and beaches. Maui is the second most populated Hawaiian Island, but much less so than Oahu. Tourism is the dominant industry on Maui, and many of the scenic beaches are fronted by luxury hotels. The properties are meticulously maintained and there is a plethora of shopping venues and restaurants. Mount Haleakala towers over the eastern part of the island, and a vast wilderness covers much of its slopes. If feeling adventurous, graduates may want to take a guided bike tour down from Haleakala's peak. The smaller, western side of the Maui features Lahaina, a former whaling village, and Kaanapali, a coastal region with some of the nicest beachside hotels. Kauai, also known as the "Garden Isle," is perhaps the most laid-back of the main Hawaiian Islands. The main city of Lihue is not particularly touristy, but there are nicer areas to the south and north. On the south side, Poipu is Kauai's equivalent of Waikiki, but on a much smaller scale. Located on the drier side of the island, Poipu has sunnier weather, good snorkeling and some of the grander beachside hotels. It also has a number of shops and restaurants. Further west is Waimea Canyon, the impressive "Grand Canyon of the Pacific." The north side of the island, called the Napali Coast, is sparsely populated but contains luxurious resorts in Princeville near Hanalei Bay. The Big Island, also known simply as "Hawaii," is considerably larger than the other Hawaiian Islands. Because of this, different parts of the Big Island can be a few hours away by car. Most visitors fly into Kona, which is on the western side of the island. Because the tradewinds depost most rain on the eastern side, Kona is sunny and arid. Further, much of the surrounding land is covered by lava rock from past flows. Nestled among the landscape, Kona has several posh resorts, nice beaches, shops and restaurants. Hilo, the other main city, is on the opposite side of the Big Island. Hilo is located in a much wetter region, and it has lush foliage and waterfalls to show for it. Hawaii boasts two active volcanoes, which are top tourist attractions. The Big Island is more varied and spread out than the other islands, and that aspect makes it some people's favorite. Get a free quote for your senior trip to Hawaii!